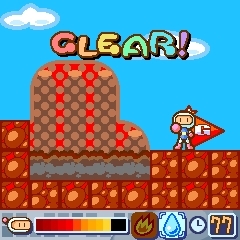 A 2D platformer. Bomberman traverses through the land, battling the Puronoaku gang! Each stage consists of 3 areas, with a boss encounter at the end. 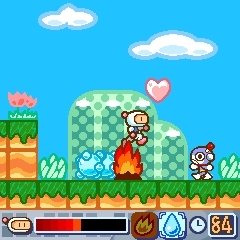 Bomberman sports a life gauge that allows him to survive enemy attacks. Fire Bomb: Can destroy bricks. Can knock down trees to create bridges. Aqua Bomb: Extinguishes fire and lava. Ice Bomb: Freezes water and fountains. 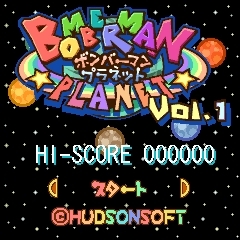 Hurricane Bomb: Bomberman can ride the air blast to jump higher. Other items include Life Recovery (refills health, 2000 points) and Bomb Stars (1000 points). Although only Volume 1 is listed on the site, its description states Volumes 2 and 3 are also available. 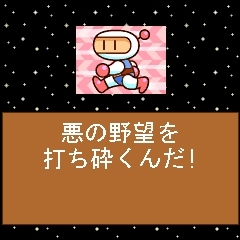 The game appears to be a graphic swap of Bomberman Jetters Vol. 1 from 2003. The old page, with a reasonable amount of game info, plus controls! No images. You'll barely learn a thing from the current version, though.